This index only lists labels whose music has been played on the K&D Bazaar. 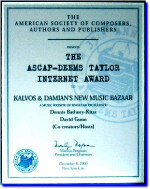 If your label distributes the music of contemporary composers in the K&D world of tastes, then please contact Kalvos & Damian. If you know of net sites, contacts or addresses for the unlinked recording labels listed below, please contact Kalvos & Damian..
An extensive list of music labels beyond those played on the K&D Bazaar: The Harmony Music List.